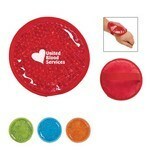 Show off your brand and show how much you care with personalized first aid kits from Promotion Pros. We offer a variety of first aid kit options including 133-piece all purpose first aid kits, auto safety kits, companion care first aid kits and more, so you're guaranteed to find exactly what your patients and employees need. Custom first aid kits are great to give away at community events to show you care, share your medical office information and encourage new patients. The Compact 85 Pc 1st Aid Kit features water resistant EVA case with carabineer and allows adding brand logo to create amazing Personalized Giveaways. This Tin First Aid Kit comes in a 2 Different colors and includes the following 4 latex-free bandages, 2 snip bandages, 2 antiseptic towelettes, 2 first aid cream packets, a hand sanitizer packet and a 2" x 3" adhesive pad. Insert your company details to create impressive Custom Logo Products. 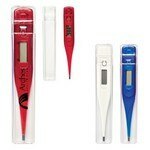 The Fahrenheit Thermometer features digital LCD display which measures temperature in Fahrenheit that enhances Beep alert. It also comes with a protective travel case. 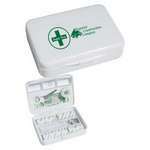 The First Aid Kit is a useful fit that has all the necessary requirements for dealing with emergencies. It comes in an attractive red zippered pouch that can be easily looped on to belts. Soother tired eyes after spending hours on the computer with the Plush Gel Beads Hot/Cold Eye Mask. Imprint your business logo on the eye mask to increase your brand’s visibility. 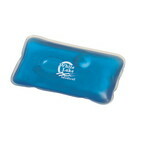 Use the Plush Gel Beads Hot/Cold Pack to relax tired and sore muscles. Imprint your company’s logo on the pack to expand your brand’s outreach. Relax after a hard day’s work at the office or at the gym with the Plush Small Round Gel Beads Hot/Cold Pack. 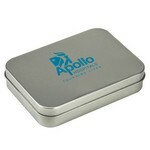 Imprint your company’s logo on the pack to expand your brand’s outreach. 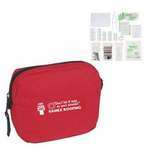 The Primary Care Non-Woven Event First Aid Kit features high quality 80 GSM polypropylene construction and allows adding brand logo and message for Business Swag. The Reusable Heat/Cold Pack is ideal to come home to, after a tough marathon, a tennis match, a long run, or a rigorous daily exercise routine. It is available in an attractive shade of translucent blue and evokes a feeling of calmness and content. The Small First Aid Box has some of the most commonly used items to deal with small emergencies on shop floors, offices, schools, and colleges. 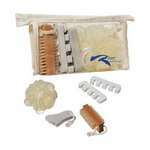 It includes an assortment of bandages, bandage fasteners, ear swabs, rolls of cotton, roll of tape, scissors, and an inside compartment for pills.